As coffee aficionados are becoming increasingly discerning in purchasing coffeemakers, more and more commercial-grade coffeemakers are being made available by the companies aiming to enable coffee lovers to keep making café-quality coffee themselves right in the comfort of their homes. Having as many options as possible is good for consumers, but variety is beneficial to us only to a certain point. All commercial-grade coffeemakers will be no different from one another if the companies continue to include as many features as possible in each new one. It is fortunate then that companies like veteran high-end coffeemaker manufacturer Capresso have been producing commercial-grade coffeemakers that provide coffee enthusiasts more than the others in terms of innovative features. Take for example the Capresso EC Pro Espresso & Cappuccino Machine. 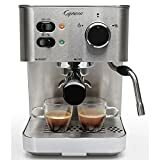 It has a 15 bar pressure pump, which ensures every cup of espresso it prepares comes topped with luscious crema; commercial-style power frother, which enables you to make foamed or steamed milk easily for cappuccinos and lattes; large integrated cup warming tray on top, which enables you to leave your cup of coffee along with your family’s, friend’s, or guest’s without worrying that they might get cold; 42 oz removable water tank, which not only enables you to prepare multiple cups of coffee at one go, but also makes cleaning the coffeemaker itself a cinch; removable stainless-steel drip tray, which makes cleaning it even easier; and indicator lights for ‘off’, ‘on’, and ‘coffee/steam’, which not only makes operating it a breeze, but also prevents accidents. Hence, you might ask yourself: What makes it unique? We assure you: The coffeemaker comes with several more features that are surprisingly innovative. The most notable, as far as we’re concerned, is the ‘bottomless’ espresso filter. Designed with knowledgeable coffee connoisseurs in mind, this unique filter generates pressure according to the ground coffee beans’ size and the way they were tamped. The pressure can be adjusted by changing the bean’s size, how they were tamped, or even the age of the beans themselves. Thus, the coffeemaker gives savvy users more control than the coffeemakers they’ve used before. But if you aren’t a coffeemaker whiz, we trust you’ll love its double-spout espresso filters and ‘advanced’ pump boiler. One espresso filter was designed for convenience and the other was designed for control. You may use the one you’d prefer. Thus, we trust the coffeemaker is more convenient to use than the coffeemakers you’ve used before. Its advanced pump boiler maintains a reservoir of hot water at the optimal temperature for brewing. Always having water for brewing enables it to prepare coffee faster and more consistently than most of the other commercial-grade coffeemakers currently available in the market. Thus, we trust it’s more reliable, as well as easier to use, than the other coffeemakers you’ve used before. Having more than one espresso spout enables you to prepare two cups of espresso at just one brewing cycle, making it even more convenient to use. It also comes with a coffee scooper/tamper, which enables you to prepare coffee with precision. While the double-spout portafilter basket makes preparing coffee a breeze, according to a few consumers, its poor design makes using the coffeemaker itself not as convenient as it should be. To be precise, it has no spring clips to keep it in place, causing it to fall out easily. The other complaints are: the drip tray is made of a material that doesn’t heat up as well as it should, and the holes in the drip tray grate aren’t aligned and thus cause a mess during use. According to a fellow reviewer, the coffeemaker would be more effective if it came with programmable buttons. It, however, has received an impressive rating of 4 and a half stars out of 5 on Amazon. Just because the features included in commercially available coffeemakers are increasing in number doesn’t mean we all should be content. As true coffee lovers, we should always demand the best from the companies producing them. This involves demanding coffeemakers that push the envelope, like the Capresso EC Pro Espresso & Cappuccino Machine, to be made available commercially. It’s the only way of ensuring we’ll continually have great coffee made ourselves right in the comfort of our homes.